Roger Waters, joined by Pink Floyd drummer Nick Mason, surrounded by a band of ringers, performing the entire Dark Side of the Moon suite start to finish. Some nights the stars just seem to align and everything goes right. Such was September 12, 2006 at Madison Square Garden. A flawless show, the perfect seats, my best equipment, and ultimately what you will hear is the best recording I have ever made, and likely will ever make. If you have not downloaded this elsewhere, do yourself a favor and grab it now. 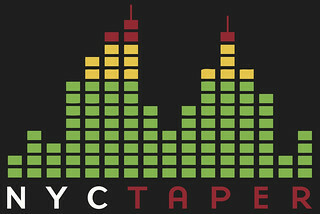 This recording is no longer available at nyctaper. You can probably find it on several sites on the web. CD Artwork may be downloaded here. This download will remain on the site until May 24, when nyctaper will premiere a new Roger Waters recording from New Jersey. purchase Roger Waters official recordings. It was announced in September, and it almost seemed too miraculous to be true. The concert was scheduled on my actual Birthday! But when the travel package was posted on the icelandair website, the concept of flying 2500 miles to Iceland became a reality. Oh, and what a reality–four days of celebration in a city that loves its nightlife. Reykjavik is perhaps the most fun city in Europe. Sandwiched in the middle was the reunion concert, which as you can tell from this recording, was sublimely magnificent. The band was tight, energetic, motivated, and was having a ball. As were we. If you were interested in this concert, you’ve undoubtedly seen many youtube clips of varying quality. At some point there was discussion of an official release, but all the members have moved on, and that seems highly unlikely. What nyctaper.com presents is the only complete recording of this concert, and in outstanding audio quality. I was able to record the concert with my best equipment, and the Icelandic audience was attentive and charming. Flac is the most common form of lossless compression. This form of file compression does not remove from the audio files any data, as do mp3 and other lossy schemes. Foobar is an advanced audio player for Windows. Cog is a Mac program (OS-X) with lossless codecs already installed to play flac on a Mac. converting to wav and burning to disc. Nero is a commercial product which supports directly burning to disc with flac plugin. Unfortunately, although Nero is popular product it is prone to frequent crashes, and disc errors. Roxio is a commercial product that offers a comparable but more stable software than Nero. Flac Frontend is the flagship program for the flac format in the Windows format. It will convert to wav, which can be burned by any pre-installed CD burner. This Sourceforge page contains many other flac program downloads and very useful information. A visit to the Sourceforge page is very much recommended. Trader’s Little Helper is a fine all-in-one lossless toolkit for Windows users.